Use this option to decide if the action you've written should replace DayBack's default behavior. For example, in the screenshot above, my "On Event Click" action just needs to record the event's start and end items in case I change them later. I still want the click to bring up the event that was clicked on, so I'll select " No" beside "Prevent default action. If I wanted to bring up this event in another application, instead of opening the popover in DayBack, then I'd select "Yes" and DayBack would stop trying to open the event after it ran my action. 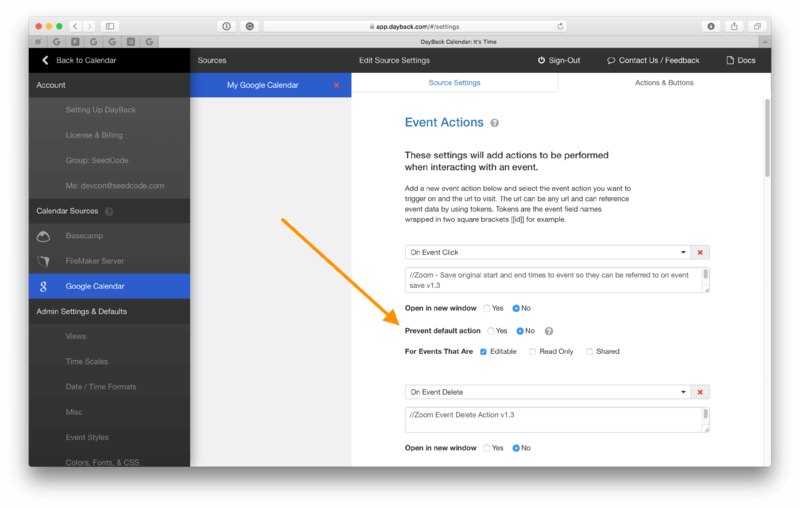 You'll see more example of both Yes and No behavior in these sample event actions. Read Only - shows up in DayBack (not in shares) and applies only to read-only events.